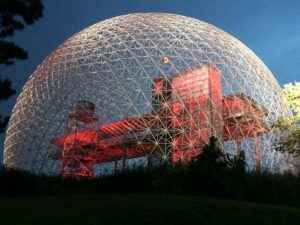 Ten days into a 12-day stay in this remarkable town, I ask Jocelyn what three things impress her most about Montreal. “The Phi Center, biking, and all the parks,” she replies. “Add to that, the Francophile atmosphere,” I say. fast to attract real sailors, which we learned firsthand. As we approached the marina, we fought a five-knot current motoring through narrows under Pont Jacques Cartier, the 40-meter-high bridge that marks the entrance to Montreal. No place for a casual sail! Once ensconced, we began our explorations. 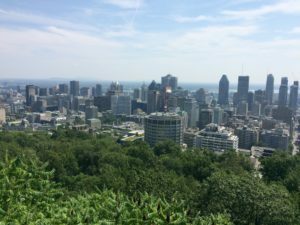 Our first foray took us through Old Montreal where we mixed with shorts and sandal clad tourists and street buskers and then along the Lachine Canal and into Griffintown where we found the Brasseur de Montreal, one of Montreal’s premier craft breweries. 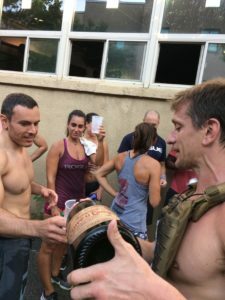 Near the brewery, we happened across a crowd on a small side street outside a gym about to celebrate a member’s accomplishment – 31 workouts in 31 days. The celebrants invited us to join them in toasting his perseverance. The next day, we took in the Phi Center. An article entitled, “The Future of Storytelling,” in an in-flight magazine tipped John off about the Phi Center where technology is used to immerse visitors in leading edge virtual reality technologies. Entering the center, we were led to a series of stations where we donned headsets and were quickly immersed in stories related using artificial intelligence, mixed reality, haptics, olfaction, and facial recognition. Sounds fancy, right? Well, it was. The upshot mixed jaw dropping stupefaction, roller coaster disorientation, and tear jerking emotions, all while sitting in a chair or standing on a spot. 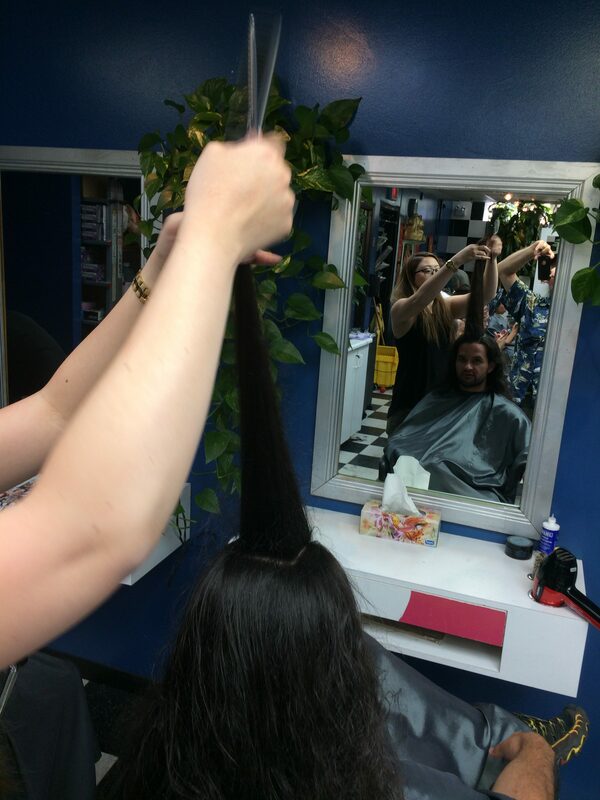 Later, John and I searched for a place for his annual hair trim. We eschewed the expensive salons and chose a functional spot in Chinatown that served the purpose just fine. 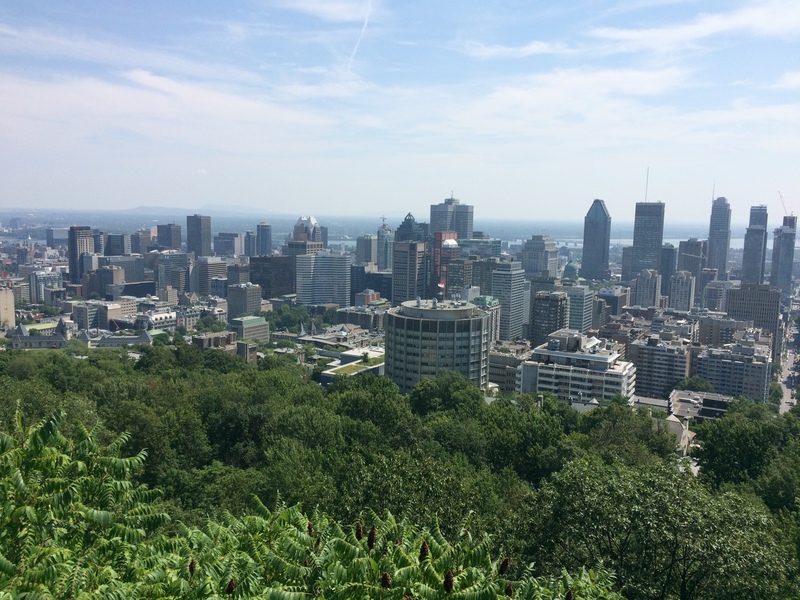 An introductory bike ride up Mount Royal and a visit to the McGill Geography Department where John investigated masters programs rounded out his time aboard. Too soon, he headed to the airport and back to reality. Thence, a daily routine emerged. First, we awake to coffee and pastries. Then, we choose which sector of the city to investigate. Typically, the Bromptons serve as our chariots. We are mightily impressed with Montreal’s bicycle paths, trails, and lanes. 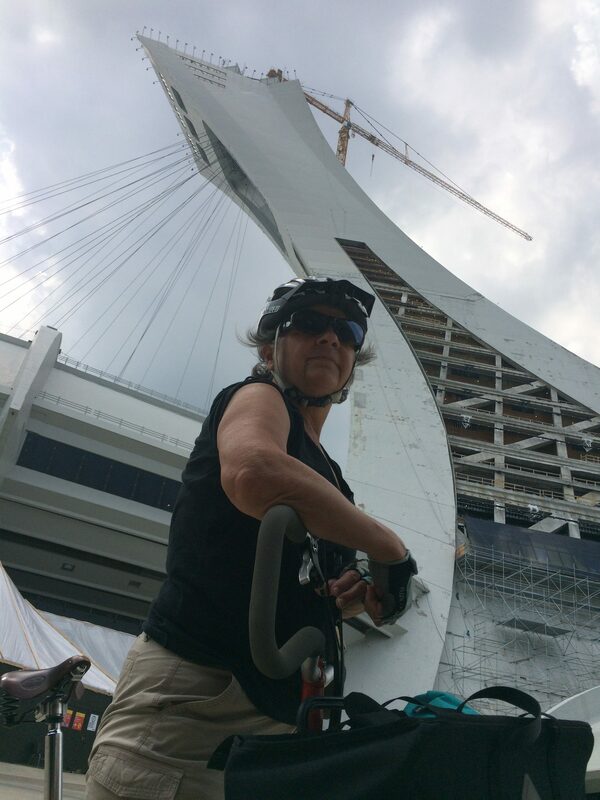 Indeed, I am ready to declare Montreal to be the best city for biking that I have ever experienced, which is a declaration I do not take lightly having biked in some pretty progressive bike-friendly towns. network. Among other features, there are gorgeous paved bike paths through parks, bike-only traffic signals at major intersections, bike lanes on smaller side streets that take up more of the street than is allowed for cars, and on bigger avenues two-way bike lanes separated from vehicular traffic by medians. The weather during our stay has been superb – mid-to-upper seventies and not much rain – inviting bicyclists out in droves, but I suspect that Montrealers take to their two-wheeled vehicles in January as well. 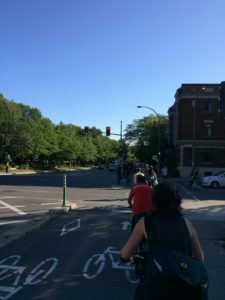 The bike lanes are busy any time of day, but at rush hour the lineup of cyclists waiting at a red light stretches the entire block. forged a connection for ships plying commerce westward from Montreal. Now, the St. Lawrence Seaway serves the purpose and the Lachine Canal has been converted into a pleasure craft waterway with bike trails along its banks. Another big attraction is the city’s phenomenal open air markets – the Atwater, Jean-Talon, and Maisonneuve. Each serves its sector of the city with fresh produce, fantastic cheeses and meats, and fabulous atmosphere. A typical visit involves browsing the aisles and marveling at the diversity and freshness of offerings, then sampling and finally choosing some delights for the evening’s meal back at the marina. remember,” (my roots) it reads so no one forgets. Indeed, in 1995 Quebec almost became a separate nation but for 0.6% of the voters who tipped the scales in favor of remaining part of Canada. Each checkout, then, proves a chance to practice the language. “Combien?” I ask. “How much?” “Cinq cinquant quatre,” comes the reply. I fish in my wallet for a five, two quarters, and a nickel, then hand it over. I walk away with some gorgeous fresh produce. Another successful transaction. Magnifique! Westmount, the richest neighborhood in the city, and then offer to give us a ride one mile to the park. Once there, we spread out our blankets on a grassy slope near the Lac aux Castors (Beaver Pond) and languish the afternoon away. 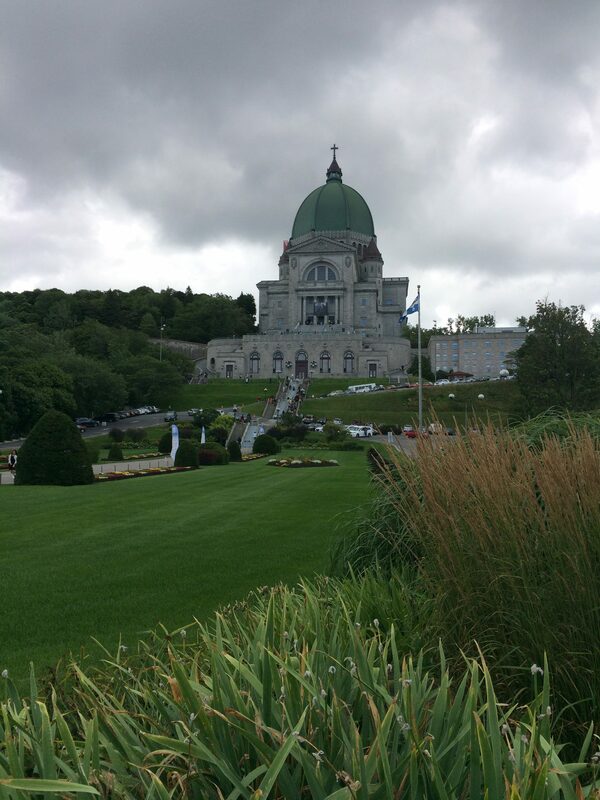 We also took in Parc La Fontaine and the Botanic Gardens, each with its own appeal. 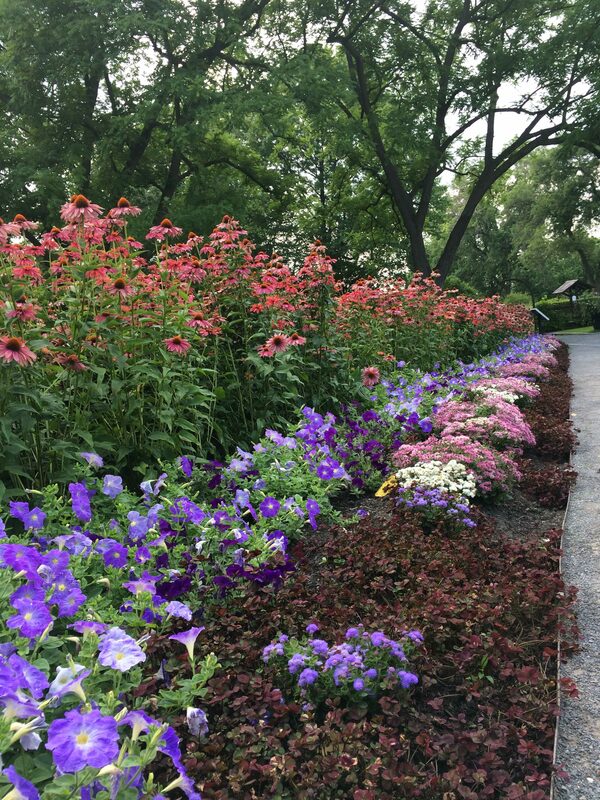 Parc La Fontaine shows off beautiful fountains and tree lined walkways. Though geographically bigger, Jocelyn felt that pound of pound Montreal’s botanic gardens couldn’t hold a candle to Denver’s. The days click along, our routine continues – awake to coffee and pastries, set out on the bikes to explore, collect delicious food at one of the markets, then return for an evening meal, often stopping for a craft beer along the way. A few variations spice up the routine, like the dance recital we took in serendipitously on a bike outing along Boulevard Lasalle, pizza in Little Italy, dim sum in Chinatown, witnessing Olympic triathletes competing in Bassin Jacques Cartier, evening entertainment by an African musical ensemble at the Vieux Port, a remarkable Saturday night fireworks display, and a ferry ride to Parc Jean-Drapeau to see the Biosphere at night. the Metro station. It seemed we had unwittingly penetrated their perimeter and were inside the concert without knowing it! 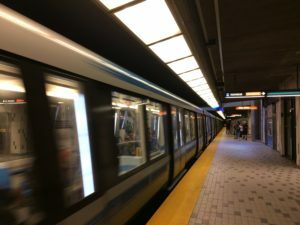 Like many world-class cities, Montreal has an extensive subway system. When we aren’t cycling around, we take the Metro, which we find very clean, efficient, and remarkably easy to use. Though quite different from the other parts of Canada we have experienced, nothing about Quebec and Montreal has done anything to diminish our immense appreciation of and affinity for this part of the world.